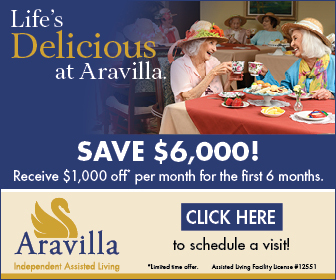 When you come to Aravilla, you won’t be on your own. We know that moving to a new home can be overwhelming, so we partner you with your own, dedicated concierge on the day you arrive. This uniquely trained staff member will spend time with you, easing your transition and making you feel comfortable and welcome. He or she will get to know you and listen to your distinct needs and preferences, so a customized plan for your care and wellness can be developed. It’s just one way we ensure that your care is truly customized to your needs—a hallmark of the Aravilla name. Your welcome concierge will not only learn what makes you special, but also help orient you to your community, introduce you to staff and residents and make sure you feel comfortable. Before you know it, you’ll have that warm sense of familiarity that only home can evoke.